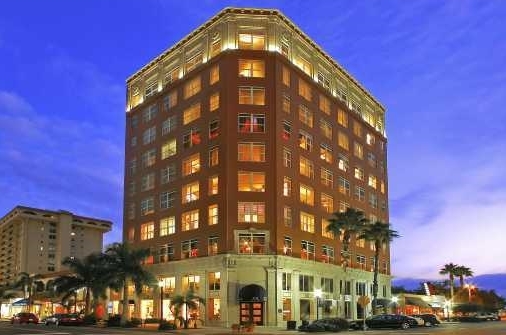 Orange Blossom Tower was constructed in 1926, but has all the modern features of today’s finest condos. Residents have access to a swimming pool, exercise room, and spa, along with concierge services. After spending a day enjoying Sarasota, relax in the comfort of your own condo while taking in the fabulous views of either the city or the water front. Orange Blossom Tower is a small building with only seven units. There is a good chance that a unit is not for sale. Once you’ve experienced the tropical beauty of Sarasota, you’ll want to stay. A perfect spot for retirement or a vacation home, downtown’s Orange Blossom Tower has much to offer. This historical building is in the heart of Sarasota’s best shopping, dining, and entertainment. Within steps of the door, one will find numerous shopping and dining opportunities. A stroll down Palm Avenue can include dinner at Caragioulas, one of Sarasota’s finest Italian restaurants. Café Epicure has outdoor seating perfect for people watching, while The Sports Page is a terrific bar and grill. In both downtown and St. Armands Circle you’ll find shops filled with unique treasures. Clothing boutiques offer everything from resort wear to high end designs. Those living at Sarasota’s Orange Blossom Tower can take advantage of area beaches for sunning and boating. A short 15 minute drive is all it takes to get to Siesta Key. Lido Key is another popular beach, only 2.5 miles from Orange Blossom Tower. One can easily reach it by bicycle. If you prefer a more quiet setting, try Longboat Key. Here the beaches are more private with fewer guests. Sarasota is also home to some of Florida’s nicest golf courses. Several are close by, including TPC Prestancia and Golf Gate Golf Club. Stoneybrook Golf and Country Club is the ideal place to spend an afternoon out on the greens. Although the outdoor activities and downtown draw in many, Sarasota’s cultural side attracts those of all ages. A true haven of the arts, this is the home of the West Coast Symphony and the annual Sarasota Music Festival. Throughout the year residents have The Van Wezel Performing Arts Center and The Florida Studio Theater to satisfy their cultural tastes. With the amenities of Orange Blossom Tower and the beauty of the surrounding area, it is easy to see why so many call these Sarasota condos home. Imagine what your lifestyle will be living in this tropical Florida setting with all it has to offer.